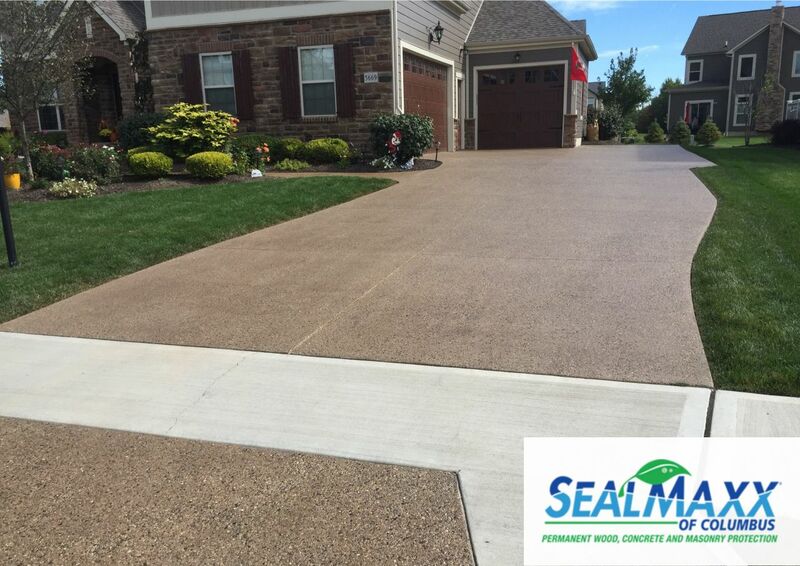 With over a decade in business, thousands of satisfied customers, over 1 million square feet of concrete sealed and an “A+” Rating with the BBB, SealMaxx of Columbus is Ohio’s most trusted expert on the proper preparation and formulated application of the right sealer for your specific concrete. When done correctly, exposed aggregate sealing will not only bring back the original beauty and richness of your floor but will also minimize spalling, freeze-thaw cycles, stains, scaling, harmful chemicals, and other abrasions. Our exposed aggregate sealers come in both a clear and browntone. Concrete properly placed and maintained will last 25+ years. Take the first step today in protecting your expensive investment and call us for a free evaluation. "Sealmaxx did a wonderful job. We had a previous company cotracted to put in a patio for us and it was a complete mess. Tim and Sealmaxx came in and fixed our problem and put down a beautiful patio. We are so happy and can not recommend Sealmaxx enough!!!" "Sealmaxx did a great job sealing our new driveway. In addition to the high quality of the work, they were easy to work with...they communicated the planned schedule and gave us continuous updates as the work was being completed. Overall, an outstanding experience! I would highly recommend them to anyone." Give us a few details about what you’re looking for and we’ll get back to you as soon as possible with all the information you need and a FREE quote. Fill up and submit this form and we’ll get in touch with you as soon as possible to answer all your questions and give you your FREE quote.